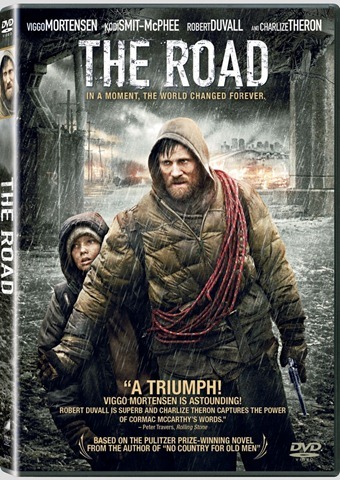 Sony Pictures has released details on the DVD/Blu-Ray release of THE ROAD, which starred Viggo Mortenson, Kodi Smit-McPhee, Robert Duvall, and Charlize Theron. The film is based on the book of the same name by Cormac McCarthy, who also wrote the book ‘No Country for Old Men’. The DVD will include commentary by director John Hillcoat (The Proposition), Making of The Road, deleted/extended scenes, and a theatrical trailer. The Blu-Ray will include these as well as BD-Live features. I did not get the chance to see this film, as it had a very short and limited release. But if it is even half as good as the masterpiece the book was, it should be pretty powerful. Probably not for general audiences, but a haunting and moving look at a father-and-son relationship among disaster and chaos. I have to admit that I had a more than emotional reaction to the book and am very excited to see how it is portrayed on film.